To expedite that process and accept more donations, we have been able to purchase that same forklift from R.S. Braswell Company that we had been renting! We have also purchased a van from Hilbish Ford as sometimes donations do not warrant taking our large truck. This allows us to do even more pickups, but also to be a little more green – taking a smaller vehicle when needed. Keep in mind when you are purchasing a new appliance or furniture for your home that the ReStore offers FREE pickup service. 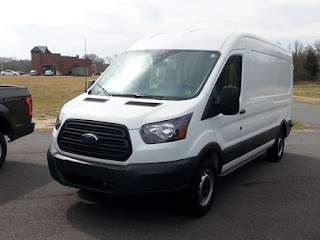 Even if the place you purchased from offers pickup service as well, remember that you can get a tax deduction for the contribution when you choose the ReStore. Fill out our Online Donation Form on our website to start the process! These purchases were made possible by a grant from The Cannon Foundation. When I was a kid we had a dog who figured out that if we were not around to let him in for the night our neighbor would if he scratched on her door. I really loved this neighbor and spent a lot of time hanging out with her after school. Between the dog and I there was an obvious path worn in the grass between our house and the neighbor’s. That’s what we do to our brains - we wear down pathways from our repeated behaviors either positive or negative. I love sugar. (Oh how I love sugar.) Sadly, sugar is not very good for me or you. It rots our teeth, suppresses our immune systems, and leads us down the path to diabetes and weight gain. But sugar tastes and feels so good. In fact, sugar lights up the pleasure receptors in our brains almost like illicit drugs. So last year when I quit putting sugar in my coffee (in an attempt to improve my health) it was quite a difficult behavior to change. Change is rarely easy, especially the older we become. And those little behavior pathways may feel more like the Grand Canyon when we try to escape them. Support helps. That’s why organizations like AA and Weight Watchers have meetings - to provide support for positive behavior change from professionals and peers. 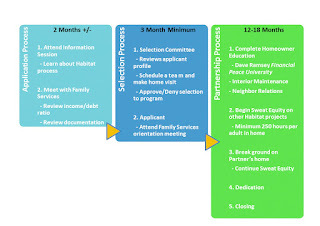 When a family enters the Habitat Cabarrus program they go through a three-stage process: Application, Selection, Partnership. The partnership stage takes the most time - from 12 to 24 months. 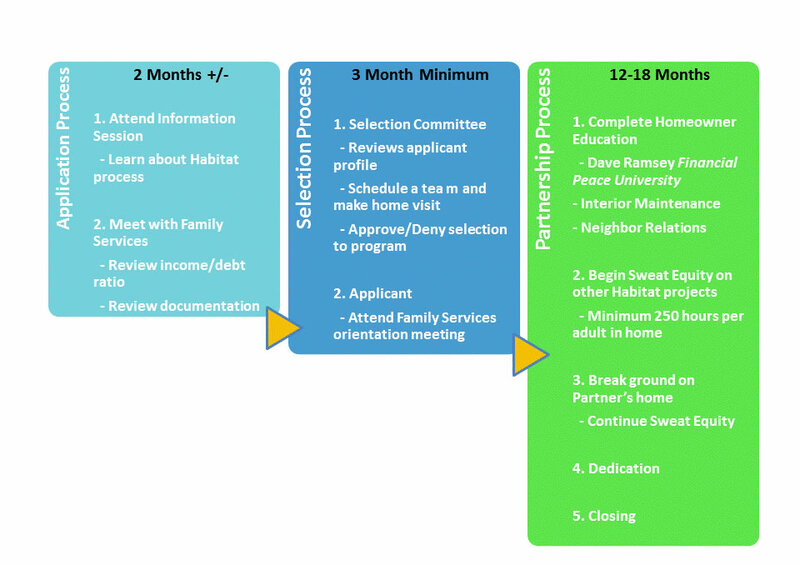 The partnership stage provides the future homeowner education and support to change mental pathways and behavior from renter to owner. The future homeowner also puts in 250 hours of sweat equity on other Habitat houses before construction begins on her own home. Why so much time? Let me explain. Most of our families are long-term renters and generations of renters are not unusual. When you rent your dwelling it’s like working for a big company. When the copier breaks - you tell someone and they call the copier repair people. The repair person comes out and fixes the copier. You are inconvenienced while the copier is not working but that’s about the extent of your emotional or financial involvement to the equipment. As a homeowner YOU bear responsibility for maintaining the equipment. YOU are the one who grabs the plunger to unclog the toilet when the toddler tries to flush socks. YOU call the plumber when the plunger can’t shift the tube socks blocking your pipes better than an NFL linebacker holding the line on 4th down. And YOU pay the plumber when they come do their magic. That’s just the toilet. What about the gutters, the HVAC, pest control, and routine maintenance items? As a former renter you have no experience in these areas. None. If you are the child of renters you’ve never watched your dad put WD40 on the hinges of the front door to stop the squeaking. You’ve never seen your mom clean out your sister’s hair from the bathroom sink. 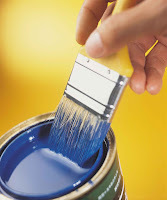 You’ve never painted your bedroom walls, never changed out a light fixture, never caulked the shower. You’ve never replaced shingles after a big thunderstorm and never paid a roofer to fix a leak. In addition to learning basic home maintenance and repairs our Partner Families also gain essential financial skills like budgeting, and cash flow planning through Dave Ramsey’s Financial Peace University. Partner Families learn about insurance, retirement planning, and how to decrease debt. These financial lessons are just as vital to their long-term success as the sweat equity hours spent on the work site installing siding, laying floors, and painting walls. Home ownership is one of the first rungs on the ladder of financial security -but it is only one. Habitat Cabarrus works with our partner families to teach skills and behaviors that help build secure futures. 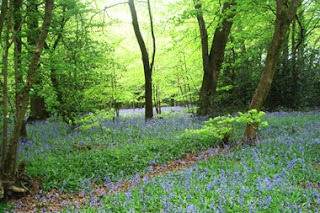 Step by step we create the mental pathway together.